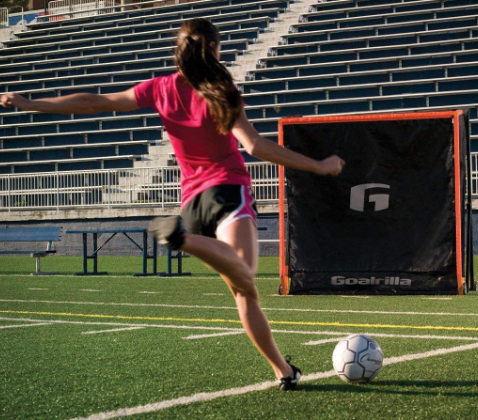 GOALS: From Goal Sports, probably the world's best manufacturer of goals. There are 20 different varieties of goals to choose from. They come in square and round posts and in varying thickness. Sizes from 8' x 24', 7' x 21', 6.5' x 18'. We also carry small practice goals. Not only are they the best quality, but you can't beat my prices. There are many choices in the sizes listed above. Different pole thickness, back depth, painted or natural aluminum. For football/soccer combination goal see bottom of football page. Available in several sizes and net thickness. Some nets are white, orange or yellow. Before you call about replacement nets( either us or anyone else) there are questions we must know the answers to. (1) Height and width of goal posts? 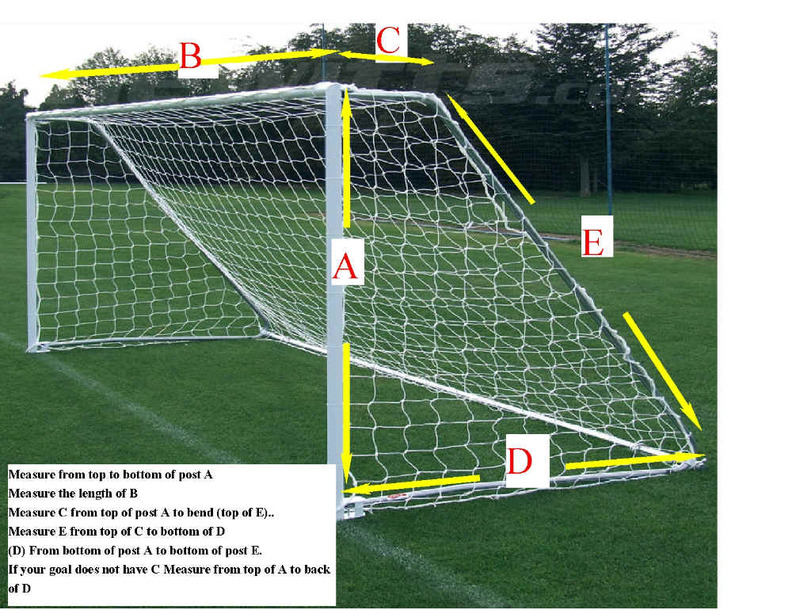 (A-B) Does the net go straight back to the ground or is there back depth? (C). From back bar to ground (at middle of curve to bottom bar E...Net thickness? The thicker the mm of the netting, the more expensive. Color Choice.? Not all nets are available in different colors colors. Price range for a pair $99-$150.00 depending of net thickness. How to Measure your Goal for replacement net. Measure from top to bottom of post "A"
Measure "C" from top post "A" to bend (top of "E") * Some goals do not have the "C" measurement. These goals have no back depth and the net goes down from top of "A" to bottom of "D" and "E". 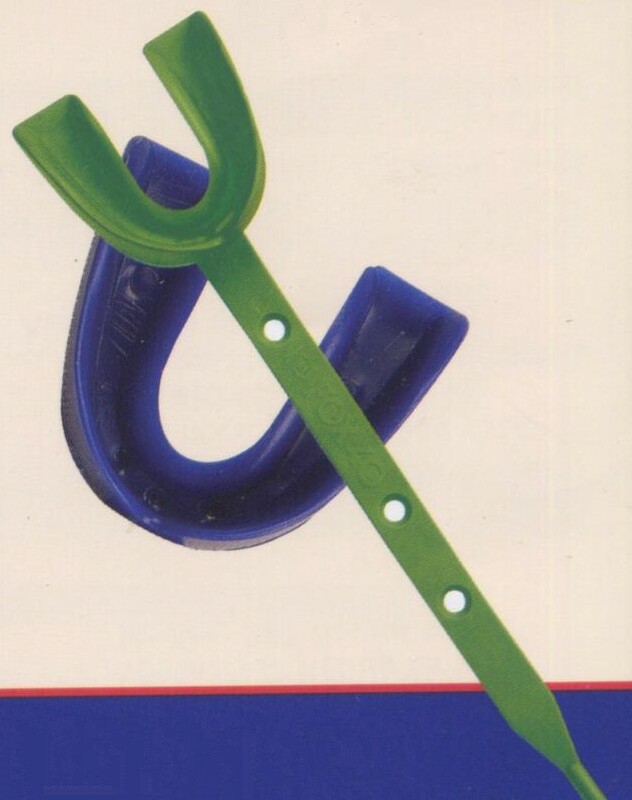 in this case measure top of "A" to bottom of "D" and "E"
One side has rebound net that is adjustable to allow balls to bounce back at various angles. Great for practicing throw ins, coming off the net for headers, passing, and trapping skills. Great teaching aid for basketball, lacrosse, baseball also. Thinner nets not recommended which are less money. (#GO-SGN721-3) 7’ x 21’ at $123.00 per pair. 6'x12', 5'x10' available. Call us with your dimensions. You have to call me and let me know your needs. If you buy a goal, we can match the net to the goal. Not all nets are in choice of colors. Let me know the size and will let you know what color is available. Line Striping Machine (#ALL500) $ 102.00. 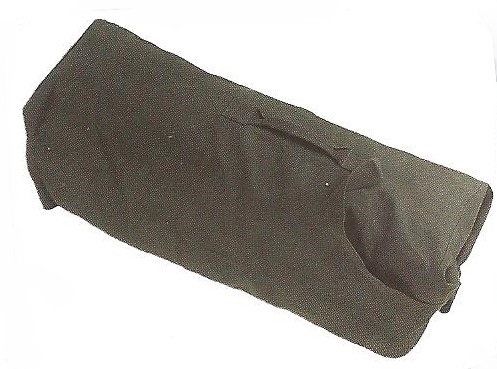 Smaller hand held wand for lining small areas is available. 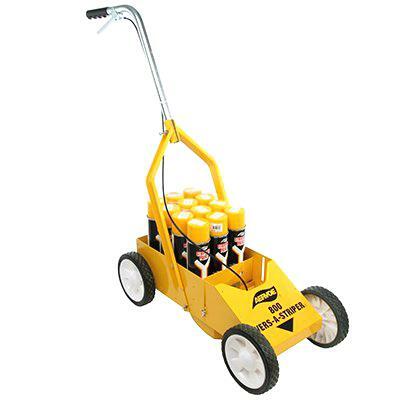 34" long with wheel to mark wet areas, ground indentations, construction digging etc. Make your fields look great. There is nothing more impressive than fields that look professional. Do you have football teams, soccer clubs, marching bands after camp? Lines are a must. 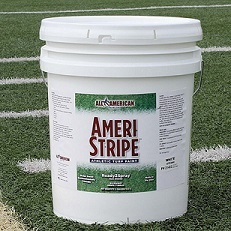 Universal Tip Athletic White Line Marking Paint for all machines. 32-59 per cases $ 36.95 per case. Yellow . Fluorescent Orange or Handicapped Blue add $5.00 per case. BULK 5 GALLON PAILS FOR GAS POWERED MACHINES. Gas powered machines available, Call for pricing ! Colors available: Red Black, Turf Green, Fl. Orange, Royal, Blue, Navy Blue Gold. Call for pricing. Mouth guards : A must for protection ! For Soccer , Hockey , LaCrosse etc. Choice of many colors. Black, yellow, red , orange, pink, blue, green, clear. 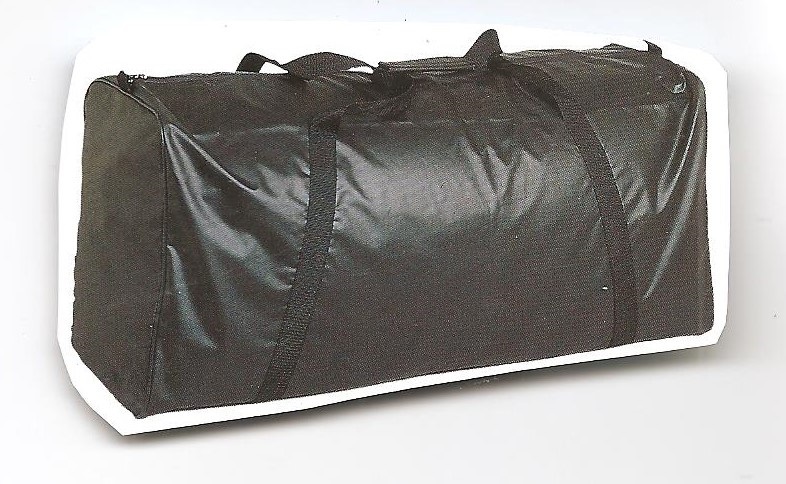 High Impact shell with soft padded back. Elastic Strap with velcro closure-per pair. Sock Style w/elastic stirrup, high density foam padding, machine washable. Pro Model (#SS90) Hi impact K-resin shell. Air cushioned pad for ventilation& shock absorption. 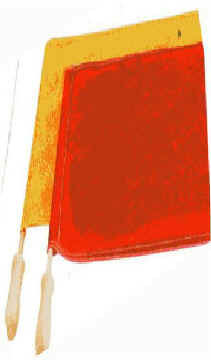 Linesman Flags: (#C-LF1) Nylon, 1 yellow, 1 red $ 6.25 per pair. Youth Goalkeeper's Gloves: (#M-SG30Y) Waffle foam palm. Nylon mesh knit glove body. Elasticized velcro wrist strap. Sizes: XS,S,M,L $ 4.35 per pair. 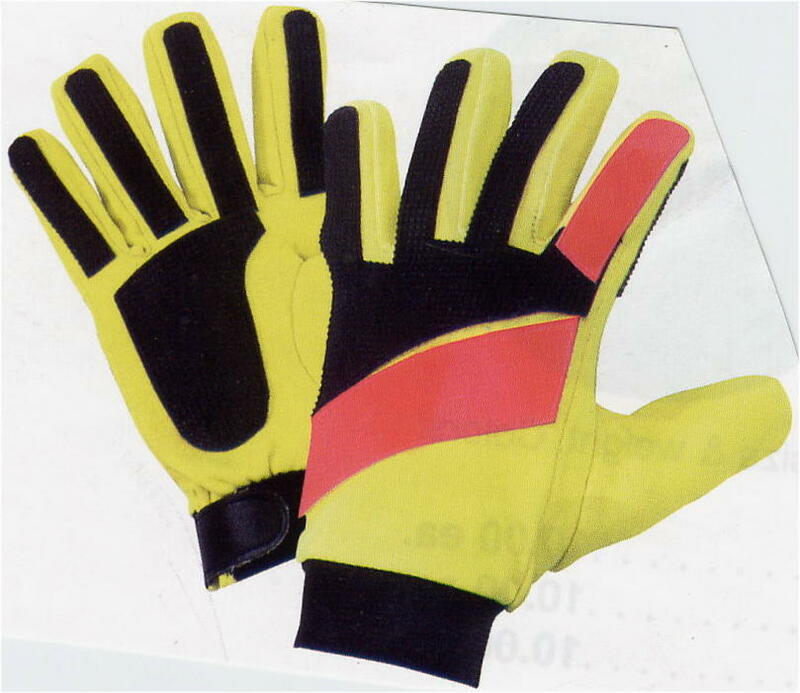 Adult Pro Model Keeper Top quality glove.(#M-SGG50). Smooth latex foam palm. PV leather with velcro closure. Sizes S,M,L,XL. Youth:(#M-SGG40) S,M,L. Both $10.75 pr. Corner Flags: Comes in a set of four flags. (#C-SCF20) same as SCF30 but no spring loaded base. $48.75. Rebound Training Nets: Various sizes-Call for details. Check out football pylons as corner markers. Weighted pylons that tip over. See football page. Very popular with many camps. Tremendous safety factor. 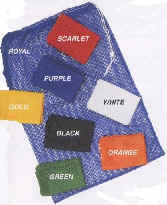 Pack of 6 colors. (#C MB22SET 24"Long x 48" wide $30.60. 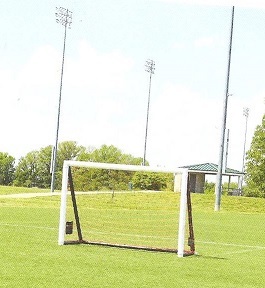 SEE FOOTBALL PAGE FOR PYLONS THAT SHOULD BE USED AT CORNERS OF SOCCER FIELD. than blows up in less than7 minutes and deflates in same time. Comes with carry bag, two way pump, and ground anchors. Flexible PVC tube design delivers safety. 6'x12' 5'x8' ( $152.00) 4'x6' ($137.50) Large sizes available.